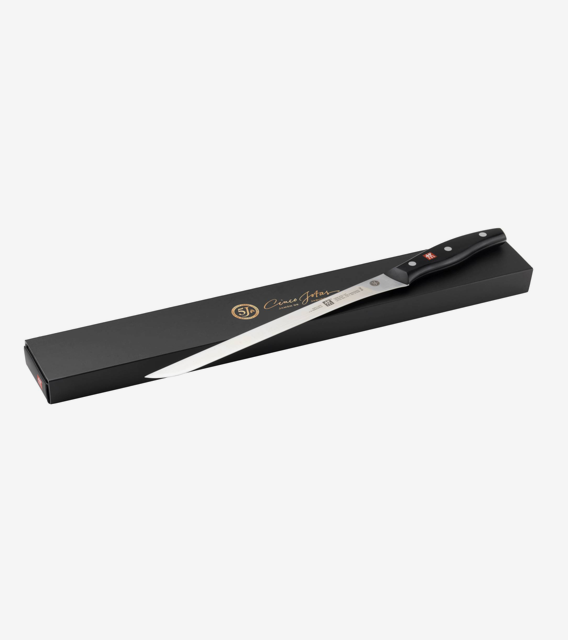 This professional 260-mm professional carving knife is sure to make you the envy of all your epicurian, gourmet jamón-loving friends. Made from a single piece of steel, this Zwilling knife provides optimium balance for safe handling while meticulously carving your acorn-fed 100% ibérico ham. Its flexible blade cuts elegant, paper-thin slices to maximize the sophisticated appreciation of premium Cinco Jotas ham. Don't you deserve to treat yourself? Make the most of your ham carving experience and settle only for the best. The pleasure of eating acorn-fed 100% jamón ibérico is accentuated knowing that you're also providing your body with the vitamins and nutrients it needs to be healthy and strong. The fine and delicate flavors of Cinco Jotas ham are known to be the perfect ingredient in many exquisite Mediterranean dishes that are enjoyed around the world. For breakfast, lunch, dinner - or even an aperitivo - the gastronomic delight of jamón ibérico never fails to enthral and delight even the most discerning of gourmet palets. The pleasure of eating both healthy and delicious is synonymous with Cinco Jotas ham. 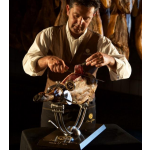 Jamón ibérico de bellota allows you to take care of your body while seducing your palate with mouth-watering goodness. Cinco Jotas ham helps to reduce cholesterol, contributes to lower blood pressure and has strong antioxidant properties. Go ahead: you deserve to treat yourself well!